Quick note before I jump into discussing the game. I’ve decided to include rarity rankings from RarityGuide.com because I think it adds a neat piece of trivia to each game. 0 or 1% is an extremely common game whereas 100% would be extremely rare. Go here (http://www.rarityguide.com/faq.php#7) to learn more about how the rankings work. 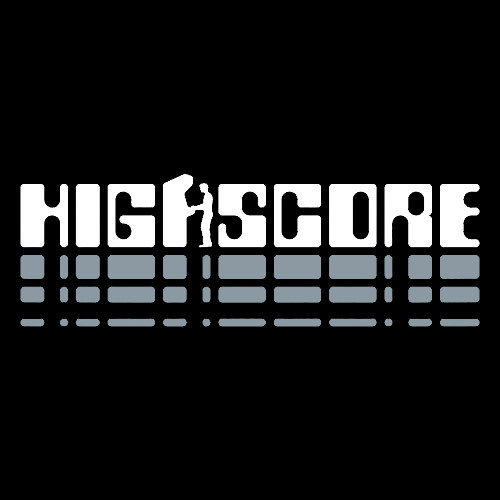 I’m going to retroactively add rarity scores to my past reviews in the coming days. You mean my copy of Guitar Hero ISN’T hard to find? Revenge of the Gator! Boy did this game catch my eye. I mean, did it ever! 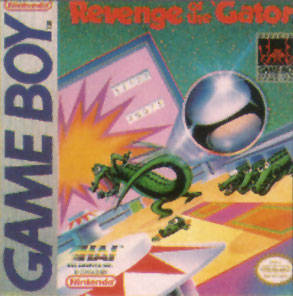 A game called “Revenge of the Gator” about pinball. The cartridge art was enough to get me to take a chance on it. It just seemed so weird. An interesting tidbit about this game is that my particular copy has the Electro Brain logo on it, whereas the game itself was originally published by HAL Laboratory, best known for their Kirby games and Super Smash Bros.
Just don’t expect to see the Gator in this series anytime soon. Electro Brain from what I’ve seen has published a few games themselves, but mostly handled publishing of re-releases of games, of which this was one of them. As I jump into the game I notice the game modes include Gator Mode and Match Play. Gator Mode is the main mode of the game and includes 1-player and 2-player alternating variants. Match Play is (I’m guessing) the 2-player link cable mode, but good luck tracking down a 2nd copy of this game unless you shop online. Since I was with friends this weekend I was able to test out the 2-player alternating mode as well as single-player. 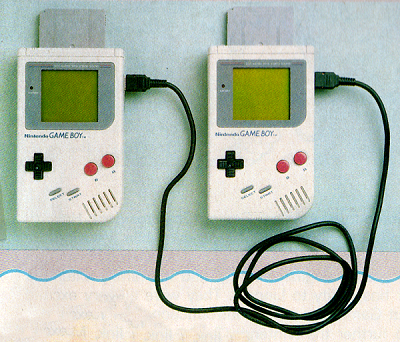 I was not able to test out Match Play as I was sans link cable and a 2nd Revenge of the Gator. The game is easy to pick up and play if you have ever played a console version of a pinball game before. A/B controls the right flipper and the Control Pad controls the left flipper. The game boasts 4 sections of the pinball table with 3 bonus round screens. When your ball reaches the top or bottom of one section, it will move to the other section. The game itself is pretty standard pinball fare. You’ve got your bumpers, lights and buttons to light up and hit, a slot reel to match symbols for bonus points. There are 3 bonus games here, but I only saw one during my play time. 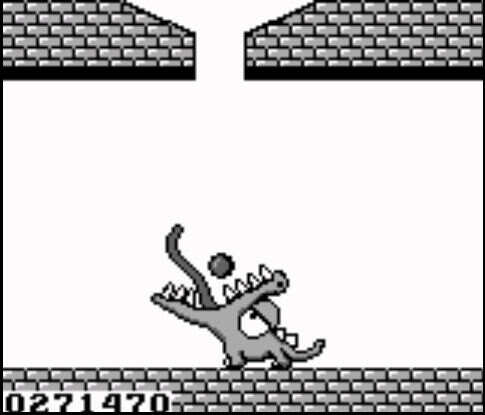 It was an Arkanoid or Breakthru or Brickbreaker-style game with the Gator on top of the bricks. If you break through the brick and hit the gator, you get loads of bonus points. 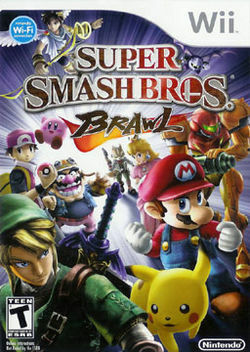 Pictured: The object of the game. That’s basically it. It’s pinball. I will say that it is fairly easy. On one screen, in order to move up to the next screen, you’ll have to perform a precise shot into a small corridor. It’s not a difficult shot, but it was the most challenging aspect of the game. My 2-player session with my friend Mike lasted seemingly forever since it felt like the game was refusing to let me lose. The Gator eats your ball when you lose. He was practically starving at times. I don’t play a whole lot of pinball video games, but I’ve played enough for this one to stand out above those I have played. What it came down to for me was the charm. I don’t know what it is, but the Gators are so damn charming. The challenge level is good, but a bit on the easy side. I would have preferred a bit more of a challenge, but it was challenging enough to keep me invested. Episode 9 of Five Dollar Gamer is ready to be fed to the Gator! If you want to leave comments, praise, criticisms, or suggestions you can leave them here, or on The Official Five Dollar Gamer Facebook Page!